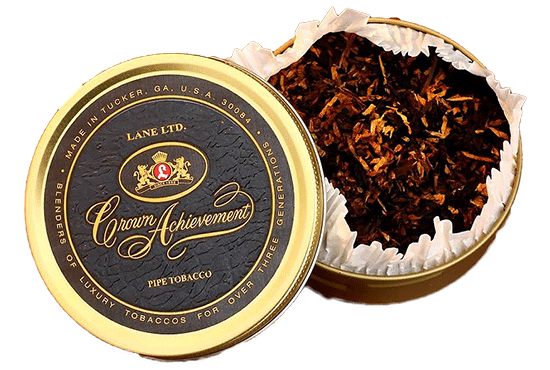 Crown Achievemant | Chicago's Pipe, Cigar & Tobacco Store | Iwan Ries & Co.
At one time, the most expensive pipe tobacco available was Lane's Crown Achievement. It was a very rich, yet smooth Latakia-based blend with a bright and smoky flavor. Over the years, the blend changed, and with those changes, the popularity waned, until, ultimately, the decision was made to discontinue it. Fast forward to 2012 when Leonard Wortzel listened to the requests from a throng of people to bring this legendary tobacco back. As he started to work on the project, he was informed by some long-time employees that the last-used version of the recipe wasn't the original. Luckily, they had preserved the classic formula in a notebook, and Leonard decided that people would prefer the early version. Lane also had to find the tinning equipment to bring the blend back in its most popular form, which they did. In fact, they were able to find their own machine from years before. The result is a blend that is faithful to its roots, down to the leather-like label. The tobacco is fragrant, utilizing very rare Orientals to support and enliven the Latakia, and choice Virginias are used to give it balance. Finally, some premium Perique is added for depth, spice and a bit of sweetness. If you had the pleasure of enjoying Crown Achievement in its original form, you'll be transported back in time with the wonderful flavor and aroma. If you never had the opportunity, you have a treat in store.